That was my initial thought when I tried on the Bull Terrier New Star for the first time. Bull Terrier is a very eclectic Japanese brand that only really cool people enjoy. They’ve sponsored awesome athletes like the Mendes Bros, Rodolfo Veira, Durinho, and Cobrinha. 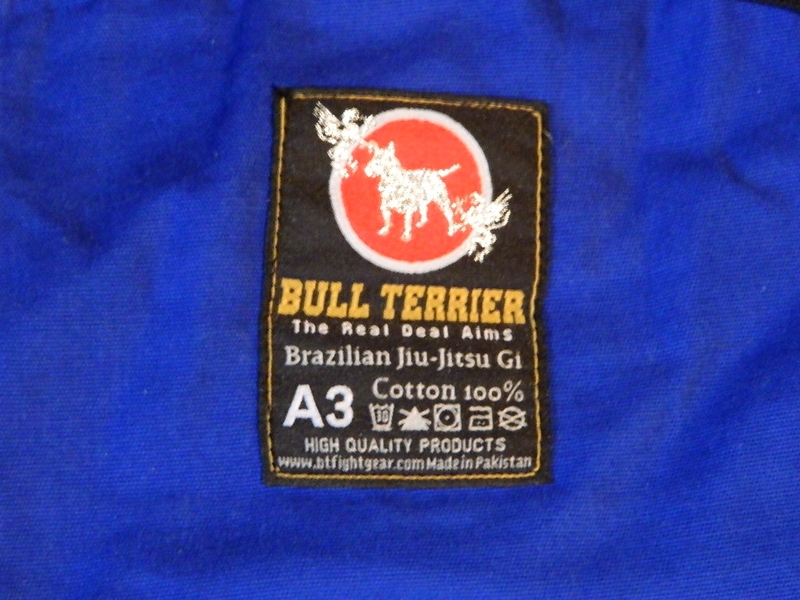 I’d coveted a Bull Terrier gi for a long time and finally decided it was time to pick one up! At 6’1″ and 200-210lbs., the A3 gi fit me very well right out of the bag. I chose to get the blue gold weave (also offered in single weave) and was really afraid to shrink it so I’ve always washed it on cold and hung it up to dry indoors as per our washing guide. The front skirt fits flush, as it should and the gi is a bit short in the sleeves. This is great as it’s really how I prefer my gi to fit. It would still be legal as per the IBJJF. The pants felt a bit wide, and why the actual pant leg isn’t very wide, what I feel made the pants seem a bit wider is the extra space in the crotch. It didn’t bulge out or anything and felt great while rolling, but definitely more room than some of my other pants (such as the Titan2 by Omega). I love Bull Terrier’s gi patches. In my mind, Bull Terrier can do no wrong in the world of bling gis. The patches are very well done and attached very securely. I love the seam tape along the bottom of the skirt (which I usually hate on most gis, but for some reason, I enjoy on Bull Terrier’s). The star embroidery is top notch and really stands out as a nice compliment to their patchwork. The print work on the inside of the gi is done with a really thick printing and has held up perfectly over the last few months. The lapel is very solid and I’ve put it through a lot of training and it’s held up great. It’s not flimsy at all, but then again, this is a luxury style gi, not exactly a lightweight competition gi. The taping on the inside of the sleeves is simple blue cotton taping that is fairly standard on most gis. I think the rest of the gi is busy enough that I’m glad they didn’t do anything extra here. The New Star Pants are in stark contrast to the jacket. Made from a very lightweight cotton, the pants are super light and feel very thin. Please not that this doesn’t mean that they feel cheap, they just feel very light compared to my Subculture and Ronin Brand Insignia pants. They feel as though they’re cut a bit wider than my CTRL Industries Rook pants, but not as wide as my Grab& Pull pants (see measurements above). The drawstring is a typical stretchy rope drawstring. It isn’t as thin as the Rook’s drawstring, but not as thick as my Grab&Pull gi either. As with the jacket, the embroidery is incredibly well done. I love the silver stitching on the hips of the gi. As a knee reinforcement snob, I’ll note that they don’t go all the way down, but they also fit my knees really well (as you can see in the photos). I rolled in this gi in the summer time. And I believe that there are two types of Gold weave gis. 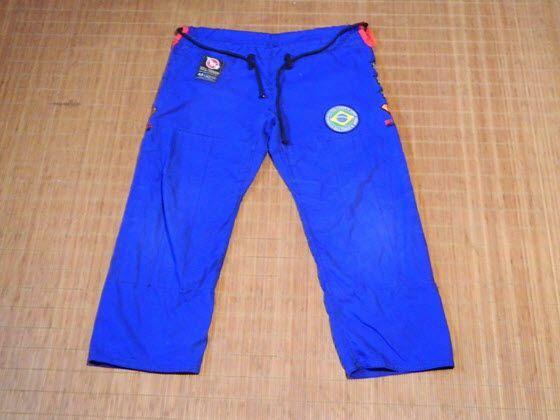 You have some that are super soft and very airy, like the SYR compadre and my Full Metal Jiujitsu gi. And then you have a more dense-feeling gold weave like my Subculture gold weave and the Bull Terrier New Star. It was definitely warm to roll in this gi with the jacket, but the pants are so incredibly light that it really compensated for it. I didn’t have any problems with the gi when rolling, none of the patches came off, and I really had a blast wearing a gi that came blinged out right out of the gate. Typically I have to bling them myself, so this was a welcome change. The Bull Terrier New Star really delivers. If I could get this gi again, I would likely try the single weave version. It’s important to note that the New Star gis have a wider range of sizes available compared to past Bull Terrier releases. This gi is definitely a must buy for any serious gi collector or bling gi enthusiast. If you’re on the fence, don’t be! Grab one asap! what size is our waist? would A3 be too big for a 33 in waist? I think an A3 would be perfect for you Dave!